Whitney Nicely started her real estate investing career after selling dump trucks! She flipped her first property in 2009 and has been a machine ever since. 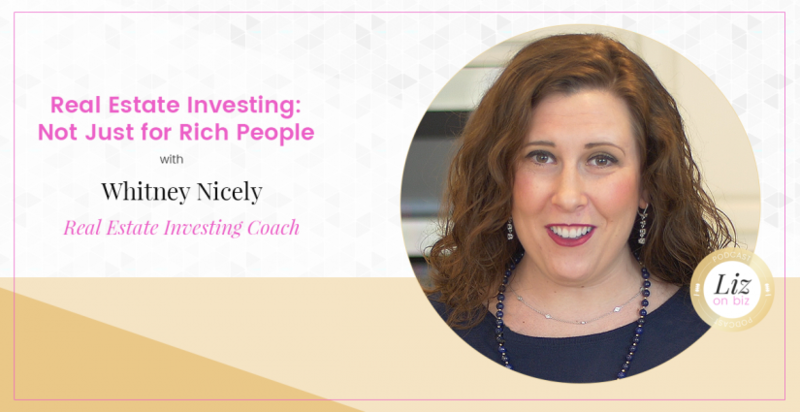 She is a very successful real estate investor and highly sought after strategist who helps others create and boost their portfolios. She flips, flops, buys, and sells and she’s awesome at it! 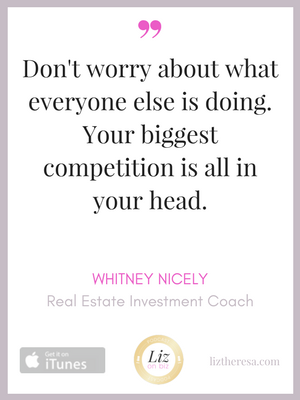 Whitney is also impressive because she empowers women to dive into the real estate investment world in order to take control of their lives and finances. [2:30] – Whitney shares her upbringing and her experience growing up with parents who invested in real estate. [4:51] – What’s one of your favorite things about real estate? [8:58] – Whitney started out by flipping couches. [9:56] – People have to be good at making fast decisions. [13:16] – Starting her Facebook group. [15:58] – Who is REI for? [20:18] – Her three books. [21:41] – That time she made a bad investment. [28:18] – Self-worth and the comparison trap. [30:31] – Staying in your own lane. Take the Liz on Biz Survey and tell us what you think! Wanna be a lead magnet? It starts with using better words on your website. Improving your copy is the absolute easiest, quickest, and most cost effective way to get more clients and cash rolling in. Fill out the form below to download my FREE copywriting training and you'll also get updates from me. Liz on Biz with Liz Theresa helps entrepreneurs overcome the mental, financial, and emotional hurdles of starting or scaling a business by sharing personal stories and valuable pieces of advice from guest experts. I’m Liz Theresa, your host. I help you launch and build online businesses you love. Feel free to browse the site, listen to some shows and be sure to subscribe and review Liz on Biz on iTunes. Thank you so much for being here!